Filipino Martial Arts (FMA) go by many different names, systems and styles (Kali, Escrima and Arne just to name a few). FMA is often thought of as just an edged weapons art but actually, it has many different aspects to it. Kali, as it is most commonly known, covers many different areas: single weapon, double weapon, long and short, and empty hand (striking and grappling). 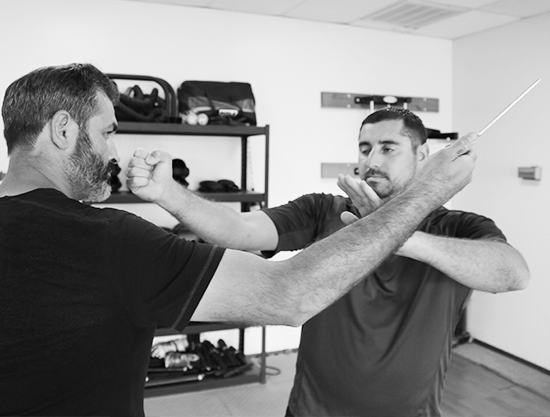 This class will help you better understand the Filipino Martial Arts as a whole as well as help you to be more familiar with weapons and weapon attacks against a stick or knife. This class will help you with your coordination, developing hand-eye plus upper–lower body coordination. Speed and precision also improve due to the angles that are trained and the understanding of the body with or without weapons.